SEASOFT's DELUXE MASK CASE is by far the most intuitive, easy to use, protective and convenient mask case you can buy. From its soft padded sides to the integrated anti-fog pocket which includes a bottle of SEAVUE 2 oz. Anti-fog Spray, the SEASOFT Deluxe Mask Case will protect your mask forever and always. One of the best features of this case is the fact that it will hold your mask WITH the snorkel attached. That's right, you do not have to remove the snorkel to use the mask case, that is just so very, very convenient. NEW! 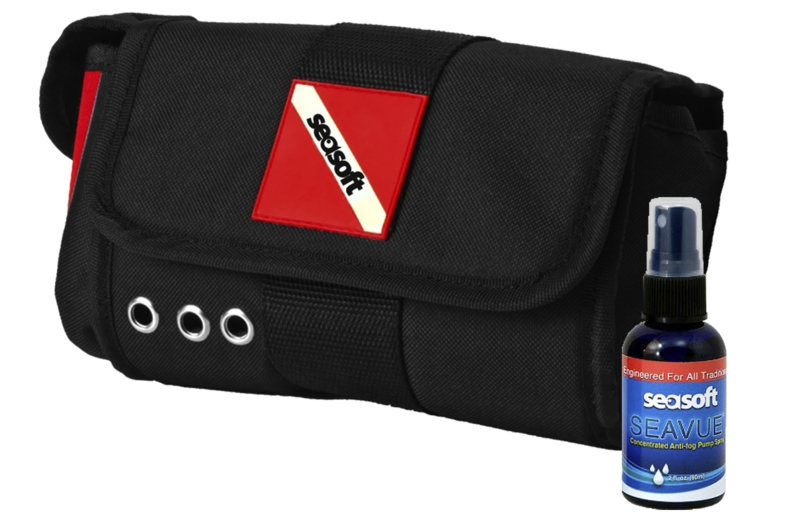 The SEASOFT Deluxe Mask Case now includes a bottle of SEASOFT's SEAVUE 2 oz. Anti-fog Spray! The SEASOFT Deluxe Mask Case is also the only mask case we know of that has not only the traditional dive flag but also the new ALPHA blue and white dive flag on the left side. So protect your mask, have SEAVUE anti-fog within easy reach and have both dive flags proudly displayed on your SEASOFT Deluxe Mask Case.